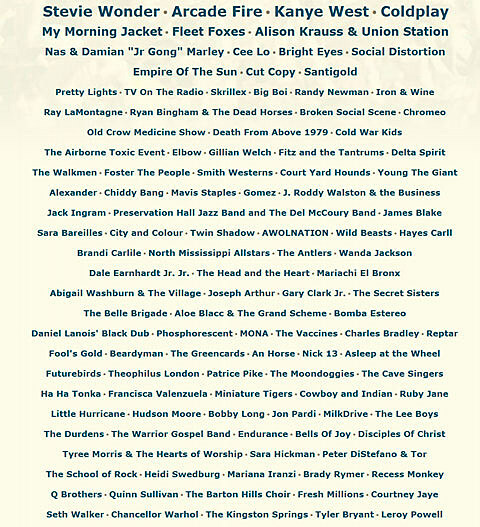 The 10th Anniversary ACL Festival line-up is on the books. Stevie Wonder, Arcade Fire, Kanye West, Coldplay, My Morning Jacket, Fleet Foxes, Alison Krauss and Union Station, Nas & Damian “Jr Gong” Marley and Cee Lo top the bill of the over 130 bands. Bright Eyes, Social Distortion, Empire of the Sun, Santigold, Pretty Lights, TV On The Radio, Skrillex, Big Boi and Randy Newman are also on tap to rock September 16-18.